Art, they say, imitates life, and the Amish culture is no exception. Beginning Monday, June 4, the Goshen College Art Department and the Mennonite-Amish Museum Committee will sponsor “Amish Arts 1900-1940: From the Pottinger Collection” in the Hershberger Gallery of the college’s music center. The exhibit will remain at the gallery until Sept. 16. It will be relocated to the Good Library Gallery of the music center from Sept. 23 through Nov. 18. The exhibit will include quilts, adult and children’s clothing, furniture and other hand-crafted items used in Amish and Mennonite homes. The art represents a fusion of the functional and the aesthetic, according to Dr. Ervin Beck, English professor at the college and representative of the committee, which has sponsored two exhibits a year since 1985. He advised visitors to look for both aspects of the items to derive the fullest appreciation of the exhibit. Amish art underwent a seismic shift in the 1930s and 1940s, as did the art in other cultures. Although the exact reasons for the “great upheaval” are unknown, “people say World War II made a huge difference in a lot of taste in folk art throughout the world,” said Beck. For example, Amish quilt colors were lightened up and paintings traditionally using a black glass background started sporting pastel backgrounds. 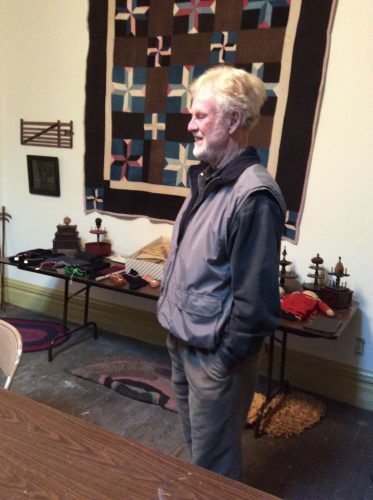 The collection was acquired from David Pottinger, a Goshen resident since 1977. He sold the first part of his collection about 30 years ago to the Museum of American Quilts. Next he “gave 104 quilts in exchange for their getting me a book contract” in New York. About 700 items were purchased by the Indiana State Museum in Indianapolis, courtesy of an Eli Lilly Foundation grant. He kept back four quilts and “a nucleus” of other items, which he recently sold to Goshen College. “Now I’m clean,” he said. Pottinger will speak on “Collecting Amish Arts” at 3:30 p.m. Sunday, Sept. 9, during a special program in Rieth Recital Hall in the campus music center. For more information, call (574) 535-7418 or visit www.goshen.edu/librarygallery.